This is a repost from 2010, but the places are still great! They have been listed by the National Trust as “distinctive destinations.” Many are off the beaten path and cost less to visit than more well known tourist areas. Many people are looking at different places to visit this year to get a non-touristy experience. Well, as much as possible anyway. These American towns have a lot to offer with historic areas, good recreation opportunities, and often great scenery. One is even the main street that inspired the DisneyWorld Main Street USA. Why not visit the authentic one! Check them out! One of the suggested trips is to see historic neighborhoods in St. Louis, Missouri. While this could be very interesting for adults, if you have children there are things for them also. The main attraction for kids is The City Museum with all sorts of wacky wonders made from pieces of old architecture and vehicles. It’s tremendous fun for adults also and gets you out of the summer heat. Don’t miss the St. Louis Arch and be sure to stop for a “concrete” at Ted Drew’s Ice Cream shop! A friend on Twitter reminded me that the St. Louis Zoo is a pretty cool zoo and it’s actually free. How many good zoos are still free? Now that’s a bargain! Click here for the list at USAToday. Let’s get that road trip started! Niki, it’s on my list too! Everyone I know who’s been there loved it. There is a school bus hanging onto the building! Some people even rent it for weddings and events, but that’s the big bucks! A very trendy place for being so full of old stuff! Have fun!!! 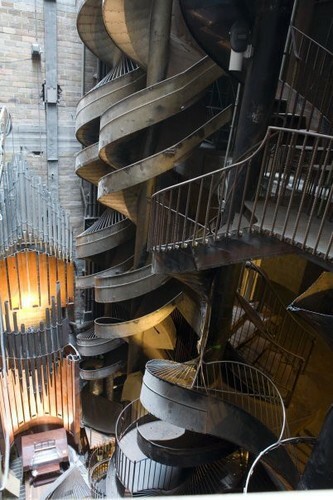 I should clarify that I meant the City Museum. We are going there as part of our road trip across America. This is the place I am most excited to see.